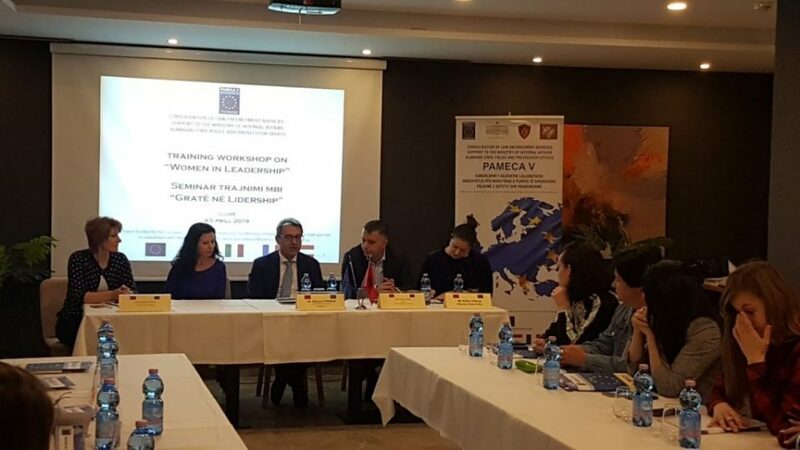 PAMECA V organised two training workshops in Shkodra on 2-3 April and in Vlora on 4-5 April 2019 on “Women in Leadership at regional level”. Apart from the presence of participants from Local Police Directorates (LPD) and Commissariats in Shkodra, Lezha, Kukes, Vlora, Gjirokastra, Berat, also speeches were delivered by the Director of LPD Vlora, Mr Atrion Duka, as well as representatives of the Commissioner for Protection from Discrimination who enriched the trainings with their valued contribution. Mr Giovanni Pasqua, PAMECA V Long-term Expert on Human Resources emphasised that PAMECA is very committed to take forward this sensitive and important topic, in order to raise awareness of various levels of police employees aiming to encourage women in managerial positions in State Police. The trainings were delivered Ms Edlira Teferiçi, Chief Commissar and Focal Point for gender issues at Albanian State Police and Ms Majlinda Vathi, Commissar at ASP and lecturer at Security Academy. The initiative of organising regional trainings on women in leadership aims to develop periodic training modules and enriching the training curricula of Security Academy in this topic.